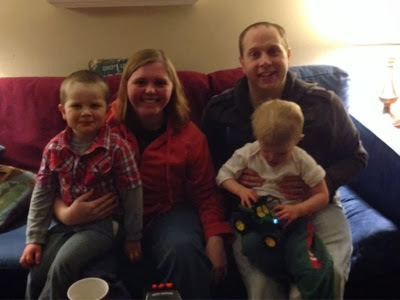 We headed north this weekend for our nephew's birthday party. Parker thought Rosco was a hoot! 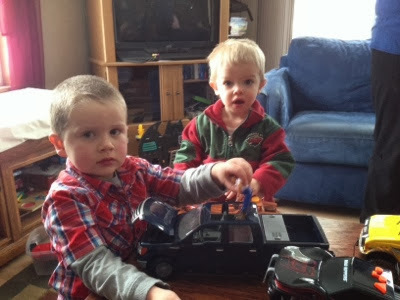 And had fun playing with all of Paul's trucks. 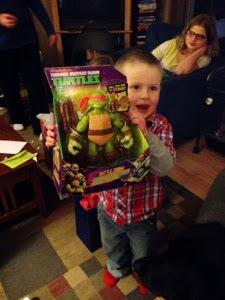 Jimmy is already coveting most of the presents Paul got, especially the TMNT! 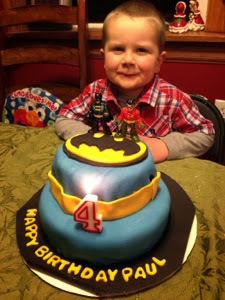 My sister-in-law made an awesome Batman (and Robin) cake! It is always fun hanging out with these guys! Plus the weather held out and it wasn't a blizzard drive home! One of my many goals for 2014 is to be more intentional with all of my relationships. I succeeded twice last week! 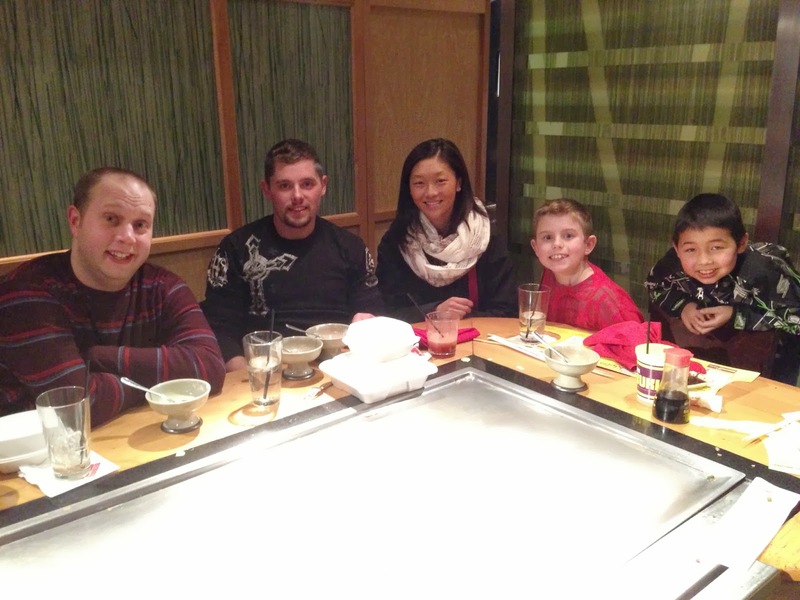 First, Jimmy and I went to dinner with my brother's family at Benihana. We had a gift card from our birthday last year so it was a thrifty night as well! 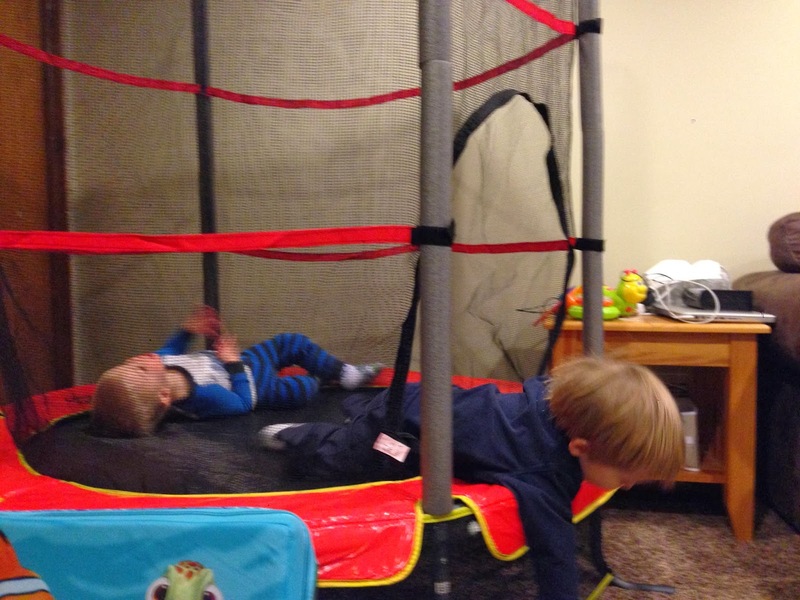 On Saturday Parker and I had a play date with our friends Simon and Shannon. It had been way too long since we got together just to play so it was fun to see them. 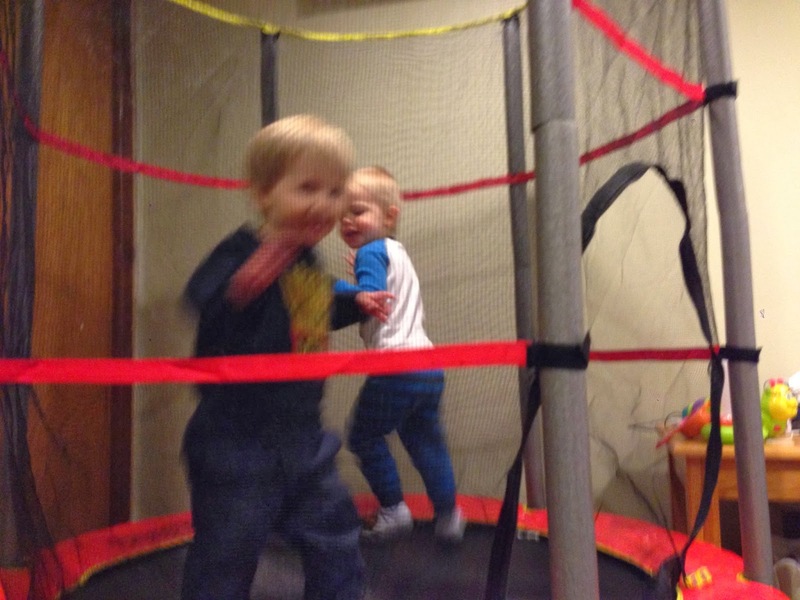 Parker got to Simon his knew trampoline. We can't wait to play with you again soon! 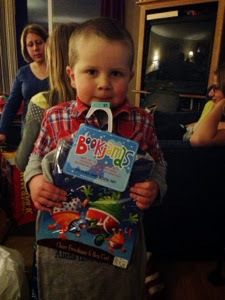 Most of the women in our group of friends from church participated in a Secret Santa exchange this holiday season. We started just before Thanksgiving and had our final party this afternoon. The rules were pretty lax, but the idea was to give a little encouragement, love and small gifts. It was fun to see something hanging on the doorknob or get a letter in the mail. We all gathered at a little cabin north of the cities to celebrate friendship. Everyone brought food to share and it was deliciously fun! We did a gift exchange/reveal and just hung out for a few hours. I am so blessed to have these ladies in my life. We made a quick trip (only 33 hours!) to Nebraska this weekend to celebrate Christmas with my dad's family. 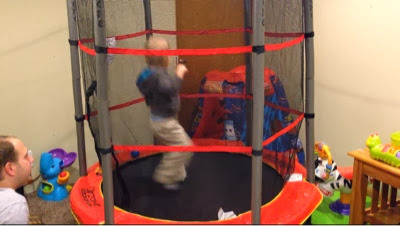 Parker had a fever last year so we didn't get to go. We left Friday afternoon and had a pretty good drive. You can make it in 5 1/2 to 6 hours with minimal stopping so I was hoping to make it in 7. The last half was pretty foggy so we slowed down a bit. We were the only car for a long time, but finally got some help when from cars ahead of us. Then we met up with my parents and followed them the rest of the way to my aunt and uncle's house. We got there in just under 6 1/2 hours, Parker stayed awake the whole trip until the last 15 minutes! We had a small breakfast on Saturday because there was going to be so much good food for dinner (that's lunch for you city folk!) People started arriving at 11 and we were eating by noon. There were just about as many desserts as there was other food so that didn't help my waistline! This weekend is the last of the holiday gatherings so hopefully I will be back on track soon. 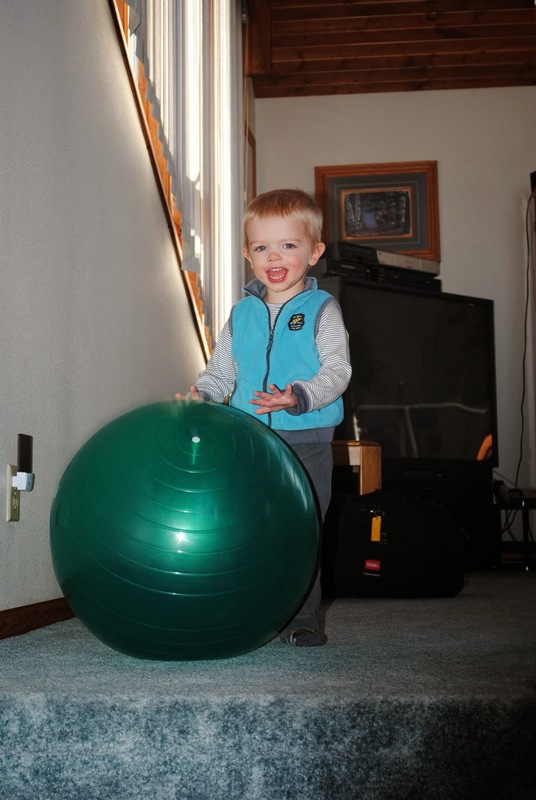 Parker and I played catch with an exercise ball, he thought that was the best! I was standing on the stairs and he would roll it down and I would throw it back up. 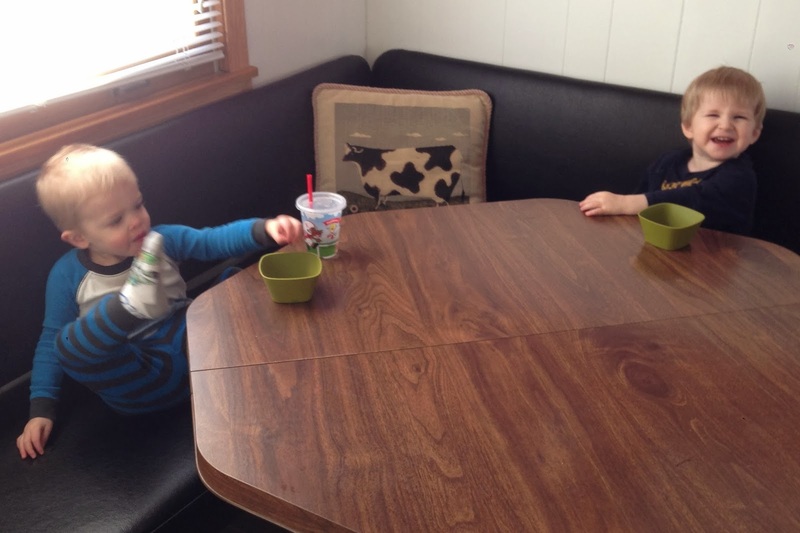 We also got to see my cousin's kids who are adorable! Rogan was born just before Jimmy and I were married! That seems kind of crazy! He is not the little guy from years past anymore! My favorite part of the Robertson Christmas is playing cards. We play pitch (kind of like euchre) and sometimes poker. I could play for HOURS (and we usually do!) I don't get a chance to play much at home, especially with this many people. We had 3 different tables and rotated so you got to play and socialize with everyone. Parker took a great nap so that made me feel less guilty about playing for so long. It was a really nice day, over 40 degrees so he ran around outside for a while before we headed home. The drive home was even smoother than the trip down. We left after supper and drove 2 1/2 hours before stopping for gas and to get Parker in his jammies. That was our only stop and we were home in just over 5 1/2 hours! Parker only made a handful of peeps the whole way! He is such a great traveler. I hope you guys had a fun weekend too! 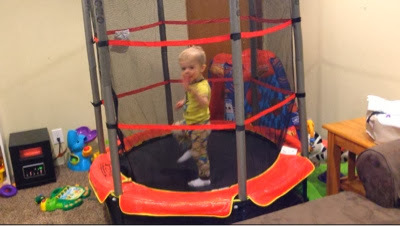 Parker got some gift cards for Christmas so we used them to buy a small trampoline. It has been a big hit so far! 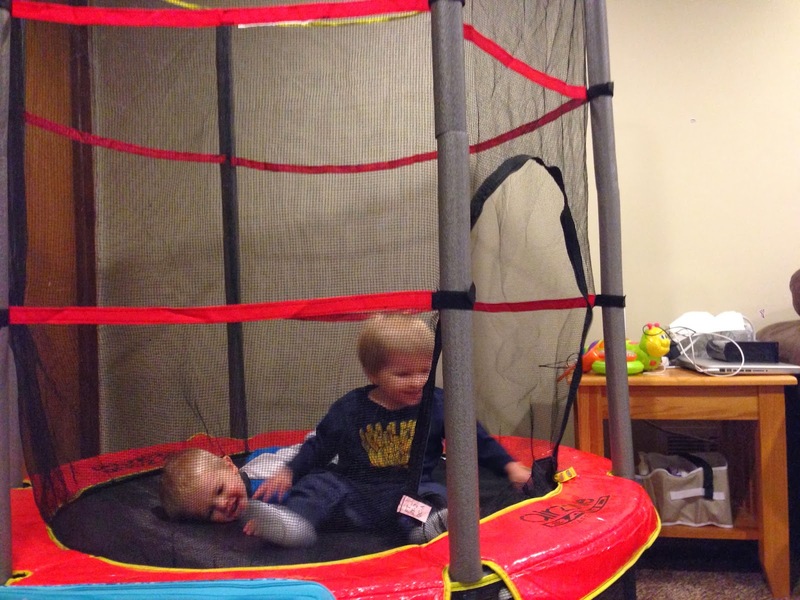 It is a little big in our family room, but will be fun outside this summer. 2013 was such an beautiful, surprising and challenging year for me. For our family. I had a few very low moments, but even more that I am immensely proud of. I am so proud of and thankful for Parker. He is the biggest blessing of my life. He had so many things thrown at him in 2013, but he has muscled through. I am so proud of all the things he has learned and the progress he is making. I am so excited to see how many more amazing milestones he reaches this year. I also could not have been gifted with a better husband than Jimmy. 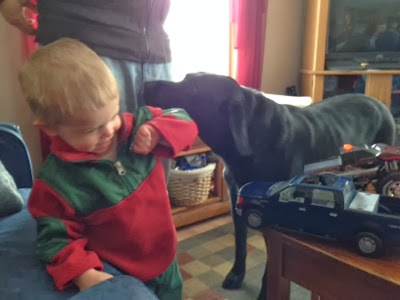 He has taken on much of the responsibility of Parker's therapy. 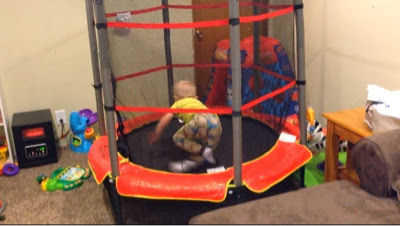 He takes him to the clinic 2 days a week and meets with the early childhood educator once a week. I know this has added much chaos and stress to his life, but I am so grateful and proud of how he has stepped up to help out Parker. Personally, I am proud of the progress I have made to get healthy. While I didn't meet my ideal goal, I did lose 35 pounds last year! I still have 54 to go and think this can be the year to make it all the way! I have some fun motivation in mind for this year, so stay tuned to hear about my adventures! I always have a tough time with New Year's resolutions. I never keep them and usually feel bad about it. But, I suppose it is never a bad thing to have positive aspirations for you life, so I will make some. -Get organized (and stay that way!) I already started this during my week off for Christmas with organizing our linen closet and doing a major overhaul of our storage area! I want to continue this throughout the rest of our house as well. -Make a budget. Jimmy and I have been skirting around this one for a while, but I think this is the year! 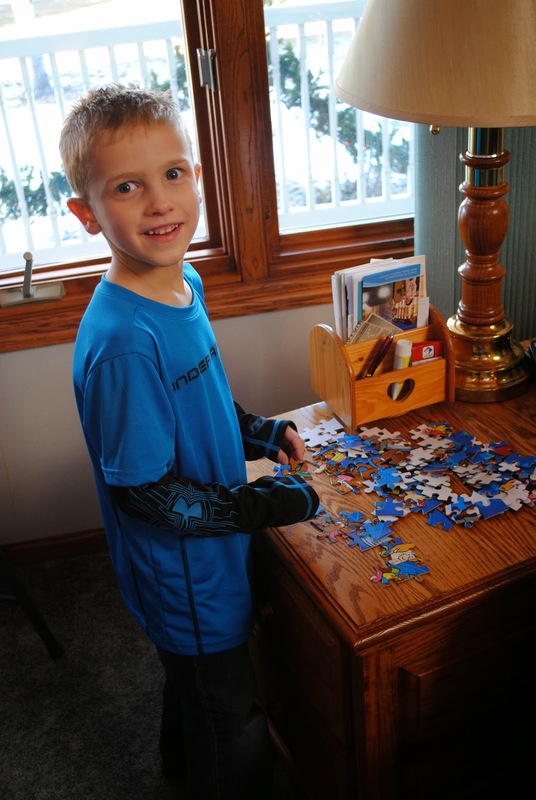 We are going to have more medical expenses with Parker's therapy so it just makes sense! I suppose that is enough for now. I hope you have some great plans for 2014 too! 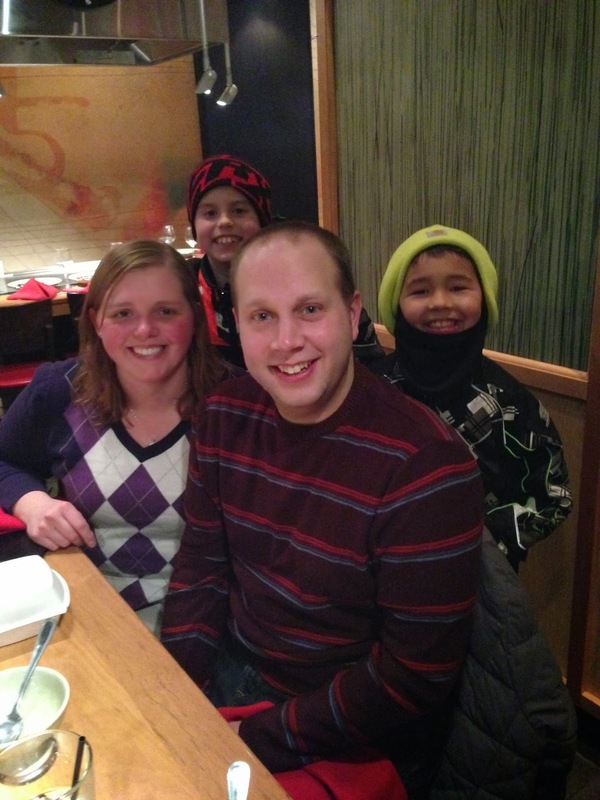 We had a great time with friends last night ringing in the new year! There were 30 or so in attendance so it made for a fun night. We started with appetizers, beverages and mingling. Tokens were given out for each game and were used to auction off prizes, it was so much fun!